Today you will learn 2 things about me. Fact: Every time I share a story from when I was young, my mom says, "You're just making that up because you had a boring childhood." This makes me crazy. Fact: When I was a small girl (kindergarten age) I had this reoccurring nightmare that girls with mustaches were chasing me around the playground and trying to kiss me. This truly terrified my 5 and 6 year old self. When mustaches starting becoming popular some years back, this dream would constantly pop back into my head. I had mixed emotions. hahahaha i absolutely love your blog. it always brings me laughs and happiness! Hahahah. I love the attitude with which you told your mom at the end of the post that you're not making it up. This was in the onion last week and it totally reminds me of your dreams--but being kissed by this lady wouldn't be so bad now would it? 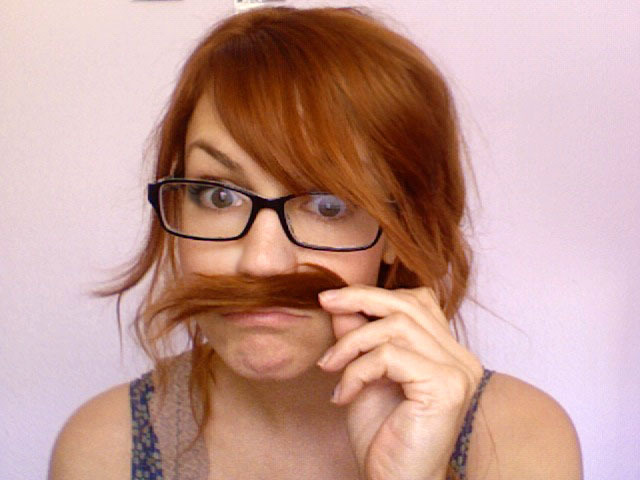 I LOVE mustaches, though for the longest time when I was little my dad had a beard. Then he shaved it into just a mustache one time, and I cried. I think I was like 5 and I had literally NEVER seen him without a beard, so he was like a stranger to me. But today I love them, and is one of the first reasons I looked into Gogol Bordello, because of their frontman, Eugene Hutz and his magnificent mustache. My mom always makes me question my childhood memories, but in my case, I usually have added to them a wee bit over the years. funny, funny, funny. my recurring nightmare from elementary school was that i was being forced to use the "public" toilet as a punishment. and by "public" toilet, i mean, a toilet that for some reason was out in the middle of the playground!!! My sister does the same thing whenever I tell stories of my childhood. Thats a pretty crazy dream girlie! Ha! So funny about your mom. Happy you can deal with them now, since they're so trendy!! You'd be running for cover non-stop! My mom often tells me the same thing whenever I tell a childhood story!! LOL, youre so funny Katie! My mom and brother are constantly telling me I am making things up and most of the time they just tell me I'm lying. Because, these things are so interesting I must lie about them. You too, right? hah! cute. you're so funny and fun. This is pretty epic.I don't what there is to fear with a mustache as beautiful as yours. sometimes there are no words. sometimes you just face you fears and you capture them, locking them away. -i love this quote!!! I remember when I was little that I was afraid of spiders, who isn't? And I was cleaning my room when I see a small spider on the floor coming right towards me. I was in the corner and there was no where to go. I screamed for my dad and he came to my rescue and killed the spider. Even to this day they still give me the creeps but at least I can kill them by myself and not have anyone do it for me! Awe yes the mustache. I always was against them myself. Now I am married to the Brawny man (flannel shirt and all)....he cured my fears. It tickles my nose though. hehehehe you're funny. that would be a scary dream. sometimes i dream that i have stubble (like man face stubble) and that i have to shave before i leave the house and i get annoyed that it's ok for boys to have stubble but not girls. I don't care how fashionable they have become, that 2nd pic scares me!! haha :) When I was little I had a reoccurring (I think i dreamed it several times but I'm not completely sure) dream too - I was dreaming I come to school and then find out I didn't wear my skirt! I remember it clearly - in my dream, all the girls in my class were standing in a row in the school hallway and the pricipal was walking in front of us, and then I found out I'd forgotten to wear my skirt!! scary!!! haha I just posted some mustaches on ETSY! The owls are so cute! You make wonderful things, Keep up the good work! You're story is so funny! My dad had a mustache for a looong time, when he shaved it off I didn't recognize him anymore. So for me it was the opposite!! :) what a scary nightmare! these photos are too cute, though!